“The conditions are now unfavorable for the apostles of absolute musical beauty; the time demands fact and a program; it calls for a Wagner or a Berlioz, as in literature it demands a Zola, an Ibsen, or a Tolstoi.” So once wrote Alexander Moszkowski, in the “Forum,” in a pleasing and clever article concerning modern composers and the influence of the time upon their works. Existing conditions, it would seem, unchanged, still render necessary “fact and a program,” though several years have passed since these lines were penned by the brother of the subject of our sketch. The effective is required. Mendelssohn, standing firm for the old traditions, once said that he found difficulty in rendering Chopin well, as it was an impossibility with him to “play out of time.” But at this period in musical history—the era made illustrious by the prominent figures of Mendelssohn and Moscheles—the transition, or merging from the classic to the romantic epoch, in reality occurred, a period that marked the infusing of the romantic movement in German poetry into musical composition. Mendelssohn and Schumann, in their songs, started a new order quite their own, that of the musical short story, which has continued to find favor, replacing the sonata as has the brief but effective narrative the old bulky or several volume novel; and among modern composers the most prolific, following this condensed school, is Moritz Moszkowski. Prior to his “Spanish Dances,” through which he first became noted, and following them, his work has been given to the world principally in the form of an immense number of short pieces and sketches, most of them characterized, as are the dances, by an effective rhythm and local color, and thus becoming at once popular. 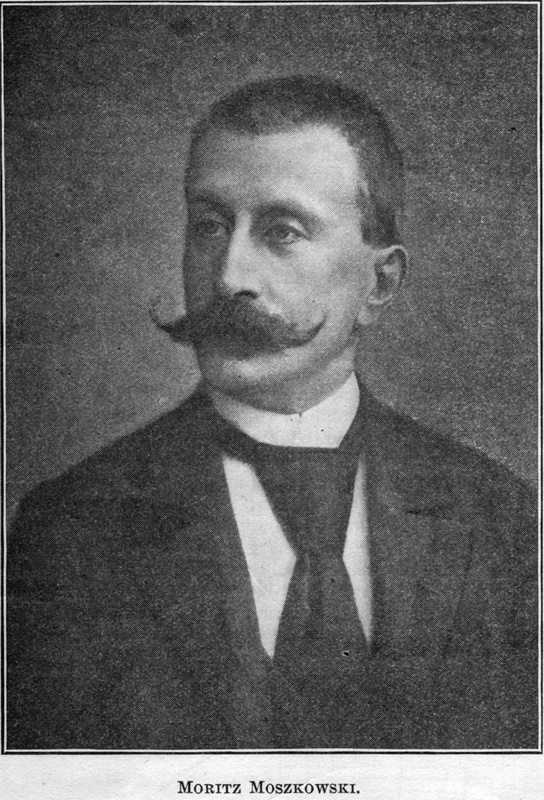 Of Polish descent, although born in Breslau (August 23,1854), Moszkowski manifested early in life his musical bent, and his first student attempts at production were permeated with those strong national traits and tendencies which characterize Chopin’s work before him, and the present work of his Polish contemporaries, among them Paderewski, Scharwenka, and Josef Hofmann; but Moszkowski, Polish on the paternal side only, and always a resident of Germany, has been influenced in his later work by his constant association with German life and with German music and institutions. He began his musical education under Kullak in Berlin, and made his first public appearance in the latter city in 1873, winning favor at once. Wishing to increase his technical proficiency, he went into seclusion at the close of a successful concert tour, and by the constant practice of ten hours a day which he imposed upon himself, overtaxed the muscles of his arms to such an extent that for many years—nearly twenty, in fact—he was unable to appear as a public performer. Turning his attention to composition, as did Schumann in a similar instance, he has added to the literature of music an immense number of productions, all bearing the impress of an intense, an effective, individuality—a characteristic of his earlier as of his later work. 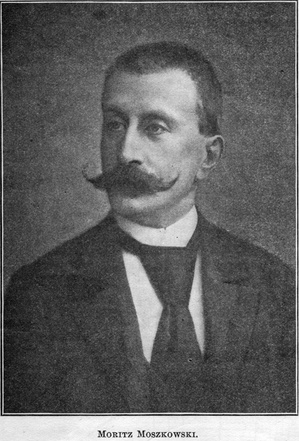 Moszkowski may be considered a classic salon composer, and his work ail bears its own original stamp; yet among his compositions may be found an opera, entitled ” Boabdil,” which was produced at the Grand Opera House in Berlin, several orchestral works, and he has also written two concertos; the first of these he himself destroyed. In Berlin his home was in Genthiner Strasse, where he resided with his mother and children. The desertion of his wife, who was the pianiste Chaminade’s sister, is a subject never alluded to by him, nor does he encourage mention of it by others. Moszkowski has had among his pupils many Americans. His Berlin studio has been described by one of the latter as having contained “little furniture, a desk, chair, and music cabinet, with busts and pictures everywhere, well-known faces of Liszt, Von Bülow, and the fathers of classic music—Bach, Handel, Haydn, Mozart, and Beethoven. A big bearskin on the floor and some target faces on the walls prove that the artist likes sport as well as art, for the marks are not on the outside rim. In the studio itself two concert grand pianos stand side by side, one which only the master plays, the other for the student who strives, sometimes vainly, to keep in time and tune with the fingers that move so easily and forcefully over that other keyboard. There are few great artists and composers of the present day who have been known to refuse exceptional inducements to leave their homes, but Moszkowski is among these,—perhaps unique among them,—in that he has declined unusually tempting offers for American concert tours. His first public appearancce (sic) after the injury sustained by the overtaxing of the arm-muscles was in Berlin, where only a short time since he played with great success his concerto in E-major, a work dedicated to Josef Hofmann. The composer now resides in Paris, occupying a portion of his time in teaching and composing, spending his summers at the seaside and among the mountains of Switzerland. The well-known pianist and composer, Mr. Gustav Hille, of Philadelphia, his intimate friend, to whom he has dedicated the most beautiful of his Ballads (op. 17), describes him as a tall, gaunt man, physically delicate, intensely interesting in conversation, quick at repartee. Witty, he affirms, original, is this composer; individual, effective, withal, as are his methods in teaching and his style in composition. You are reading Moritz Moszkowski. from the January, 1900 issue of The Etude Magazine. The Organ Contest at Kipley's Corners is the next entry in The Etude.